The Heyeck Press was founded January 1, 1976, in Woodside, California. We offer beautifully printed books with significant literary content or, in the case of the marbling books, historical significance. Our fine limited edition books have all been printed with metal type on dampened handmade paper. Their hard bindings are covered in either hand-marbled papers or hand marbled silk. Some have quarter leather bindings; some have slipcases, some have drop-spine boxes. All are numbered and are signed by the authors. See the individual descriptions for details on specific books. All of our fine books are first editions. 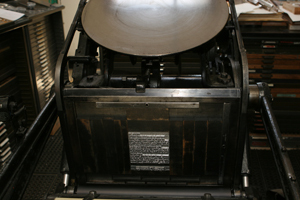 Our books in paper wrapper bindings are also printed with metal type, but the paper is a high quality 80 lb. machine made stock rather than handmade paper. They have Smythe sewn bindings or, in the case of the Flowering Quince Poetry Series, they are hand stitched. Their prices are considerably lower than the fine edition books and they are not signed or numbered. Some of the paper wrapper books are trade editions of one of our fine books. The others are all first editions. Some have hand marbled paper covers. 1981: "Fortieth Western Books Exhibition"